This weekend is election time for Tokyo and many Prefectures. The 2 big name candidates in Tokyo are the incumbent Ishihara-san and former Governor of Miyazaki-ken, Higashikokubara-san. 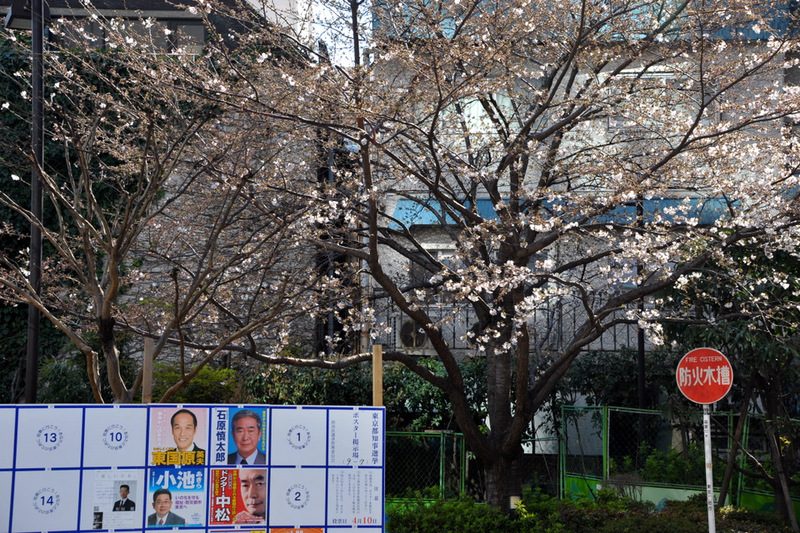 After Ishihara-san preventing people from holding hanami at various locations in Tokyo, the above shot of the candidates shown under Sakura in Shibuya seemed strange. I don’t really want to discuss politics here, but If I had a vote it wouldn’t be going to politicians who try to control the free gathering of its people. Ishihara is a real nutbag and a supporter of censorship. Can’t understand why the Japanese people vote for someone who works to ban manga which is so integral to the Japanese identity. I don’t agree with manga being banned, but do the Japanese people really take it so seriously? I thought it was more or less the equivalent of our comics. It really is a huge part of their culture. People of all ages are seen reading manga all over the place and manga like characters are used in so many things including government projects. BTW, this is also the same guy who said the tsunami was a divine punishment against Japan and doesn’t want people to enjoy Hanami this year. Who do you think will win the Tokyo Elections? Ishihara? Higashikokubara? as usual the campaigners needlessly spread noise pollution around the city. and how is that differenet from the USA!